Amsterdam is known for museums, nightlife, sightseeing, parks, and breweries. Your plan includes some of its best attractions: explore the galleries of Anne Frank House, get engrossed in the history at Verzetsmuseum, wander the streets of The Jordaan, and contemplate the long history of Rembrandt House Museum. For more things to do, where to stay, other places to visit, and other tourist information, read Amsterdam vacation builder. Lahore, Pakistan to Amsterdam is an approximately 15.5-hour flight. You'll gain 4 hours traveling from Lahore to Amsterdam due to the time zone difference. Expect much colder temperatures when traveling from Lahore in August; daily highs in Amsterdam reach 25°C and lows reach 16°C. Finish your sightseeing early on the 7th (Mon) so you can take a train to Brussels. Kick off your visit on the 7th (Mon): examine the collection at Atomium, tour the pleasant surroundings at Parc Leopold, contemplate the long history of Grand Place, then examine the collection at Manneken Pis, and finally admire the landmark architecture of St. Michael and St. Gudula Cathedral (Cathedrale St-Michel et Ste-Gudule). Get ready for a full day of sightseeing on the next day: see the interesting displays at Royal Museums of Fine Arts of Belgium, then step into the grandiose world of Royal Palace (Palais Royal), then see the interesting displays at Musical Instruments Museum, and finally admire the landmark architecture of Eglise Notre Dame Du Sablon. To find traveler tips, more things to do, photos, and more tourist information, read our Brussels sightseeing planner. Getting from Amsterdam to Brussels by train takes about 2 hours. Other options: drive; or fly. In August in Brussels, expect temperatures between 26°C during the day and 15°C at night. Wrap up your sightseeing on the 9th (Wed) early enough to take a train to Frankfurt. Kick off your visit on the 9th (Wed): explore the world behind art at Städel, don't miss a visit to Frankfurt am Main Hauptbahnhof, and then take in nature's colorful creations at Palmengarten. 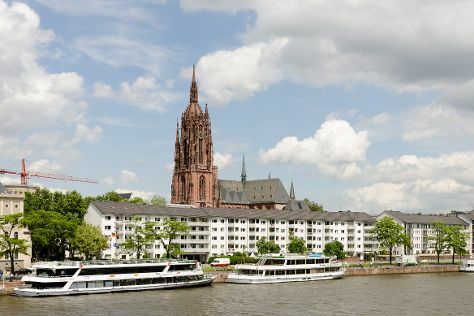 On the 10th (Thu), you'll have a packed day of sightseeing: admire the striking features of Römer, then contemplate the long history of Frankfurt Goethe House, then snap pictures at Eiserner Steg, and finally admire the landmark architecture of Cathedral of St. Bartholomew (Dom St. Bartholomaus). To find maps, ratings, more things to do, and tourist information, read our Frankfurt travel planner. Getting from Brussels to Frankfurt by train takes about 3 hours. Other options: fly; or drive. Expect somewhat warmer weather when traveling from Brussels in August: highs in Frankfurt hover around 30°C, while lows dip to 17°C. Finish your sightseeing early on the 11th (Fri) to allow enough time to travel to Prague. Prague is known for sightseeing, historic sites, nightlife, museums, and zoos & aquariums. Your plan includes some of its best attractions: snap pictures at Charles Bridge, admire the landmark architecture of St. Vitus Cathedral, get engrossed in the history at Jewish Museum in Prague, and step into the grandiose world of Prague Castle. To see more things to do, reviews, ratings, and tourist information, go to the Prague sightseeing planner. Getting from Frankfurt to Prague by flight takes about 4.5 hours. Other options: drive; or do a combination of train and bus. In August in Prague, expect temperatures between 28°C during the day and 16°C at night. Finish your sightseeing early on the 14th (Mon) to allow enough time to travel back home.